By Angelina Cheung | 16:52 請按廣告以支持本站! If you have tried to buy domestic air ticket of Australia, for example, from Sydney to Gold Coast or from Melbourne to Cairns, you will probably go to cheap airline websitse Tigeriar or Jetstar. Usually if you compare and see which one is cheaper you will buy that one. - You need to pay AUD$8.50 booking and service fee for each ticket you buy if you pay online by Credit or Debit Card, unless you have a Master Debit Card (Common Wealth, Bankwest, Westpac). NAB/ANZ/HSBC are all Visa Debit Card. - They have another airport in Melbourne - Avalon, where it is in the middle of nowhere. But the ticket is cheaper than going to another airport Tullamarine. - They have more online payment options than Tigerair. You can pay by Direct Deposit (At least 14 days before departure) or POLi without the fee of AUD$8.5 charge per ticket. Usually it seems Tigerair is cheaper than Jetstar. However, if you need to pay the booking and service fee, the price is similar. There is one way that you do not need to pay the service fee and you can get the cheapest air ticket! 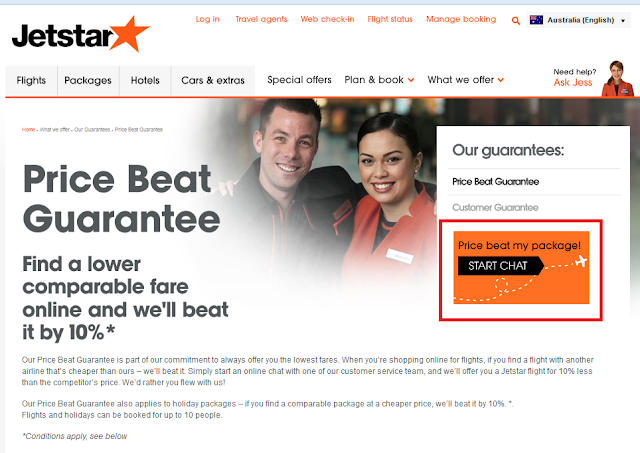 What you need to do is to use Jetstar's Price Beat Guarantee! It not only gives you the price of the competitors', but also giving you 10% off extra! So you save a lot. - An Economy Starter fare. We won’t price beat our other fares: Economy Starter Plus, Economy Starter Max, Business Class and Business Class Max fares. As there are many domestic flights within Australia everyday, it is not hard to search a flight that depart within one hour of Jetstar's (on the same route – the airports of origin and destination must be identical). I helped my friend to buy air ticket Gold Coast - Sydney. I have checked Tigerair's price and it was not bad. But adding the service fee made me feel annoyed. So I searched Jetstar's and found they had flight that depart less than one hour of Tigerair's, same as return flight Sydney - Gold Coast. You can try too! Easy, fast and cheaper.Why not then? How about accommodation? Airbnb is one of the good choices! Apart from airbnb, you can also book hotel/hostel through booking.com. This website usually don't need you to pre pay, you can choose to pay when you arrive. Click here to register. After you book and stay for the first time you can have $20 for reward. Click here to register and you will have AUD$4.5 to use.